Peanut butter is one of those versatile ingredients that plays well with both savory and sweet food, making it the perfect anchor for a Chinese New Year’s Dessert. Asian desserts are almost never super sweet and often times have a savory element to them; think red bean paste buns or egg custard tarts. 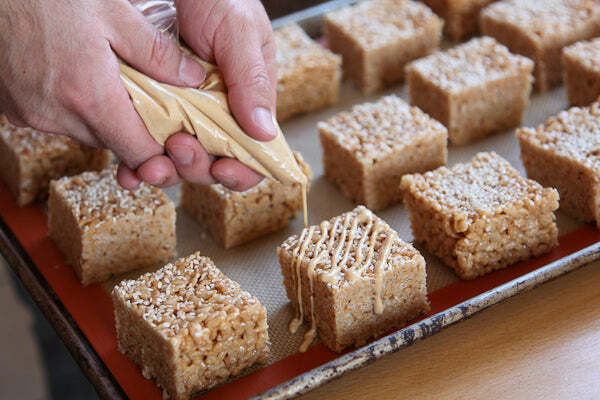 For this Chinese New Year, consider this updated American classic, a White Chocolate Wonderful Peanut Butter Sesame Rice Krispie Treat. 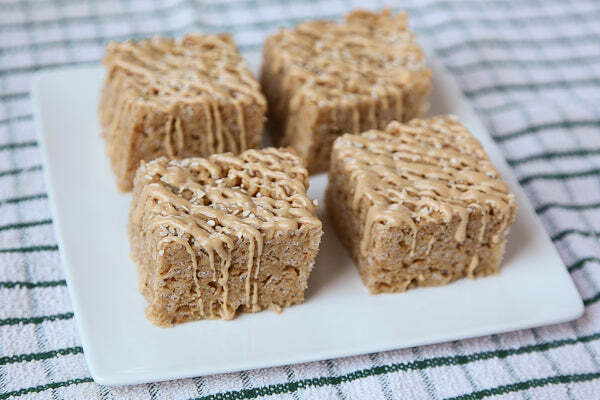 What’s great about these classic treats are they take a familiar American standard, that are a breeze to make, and that everyone loves, and gives it a slightly savory exotic twist on it. 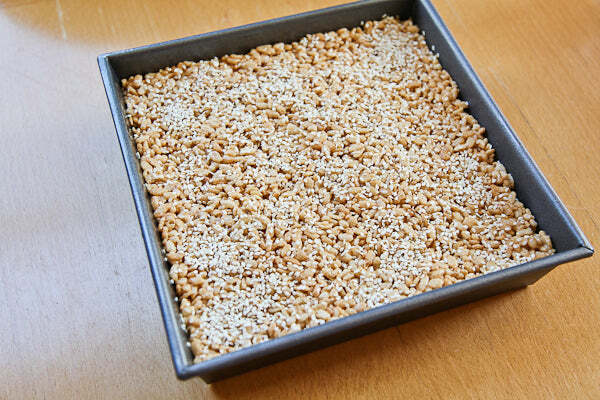 The crispy rice cereal all of a sudden becomes an Asian inspired treat with the savory sesame oil that is added to it. White Chocolate Wonderful peanut butter ties the treat together cutting the sweetness of the marshmallows, elevating them to a dessert that is equally delicious at home, at a bake sale, or as part of Chinese New Year’s dinner party buffet. 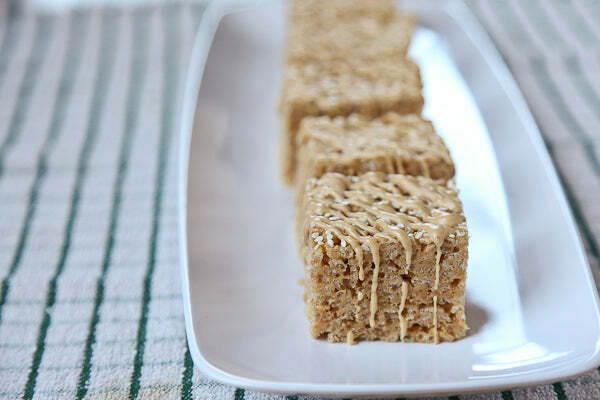 If you use a gluten free crispy cereal, this treat is naturally gluten free. 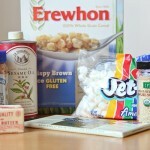 Just check your box of cereal to make sure it is labeled gluten free. 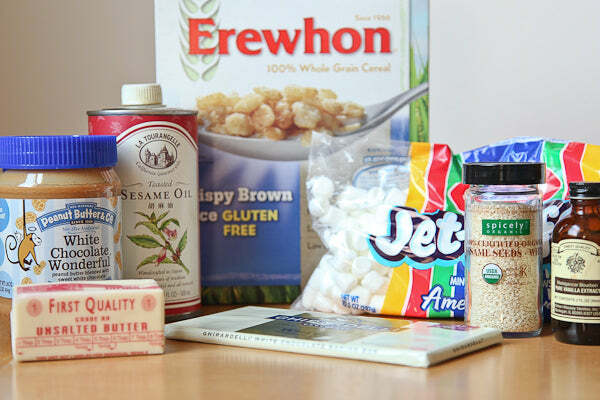 Some rice crispy cereal contain malt flavoring which is not gluten free. 1. 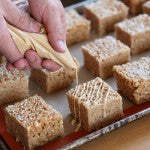 Lightly coat a 9” x 9” baking pan with a neutral flavored cooking spray like canola. 2. 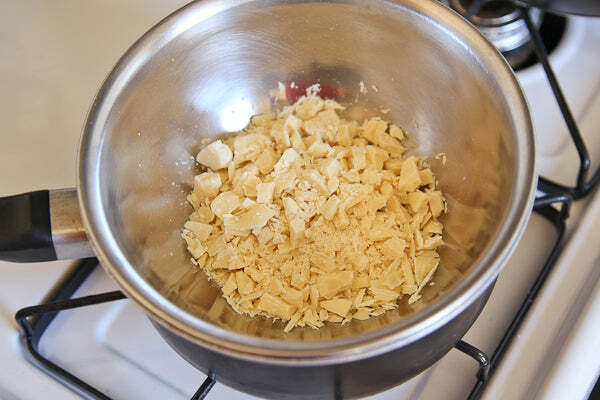 Place the butter in a large heavy bottomed pan and turn the heat to medium and melt the butter. Then cook the butter until the fat solids of the butter start to just turn brown (the butter will foam up in the beginning but subside after a while – if it hasn’t, turn the heat down to a lower power). Turn off the heat and continue to swirl the butter in the pan until the residual heat of the pan turns the fat solids golden brown and the butter becomes fragrantly nutty. 3. 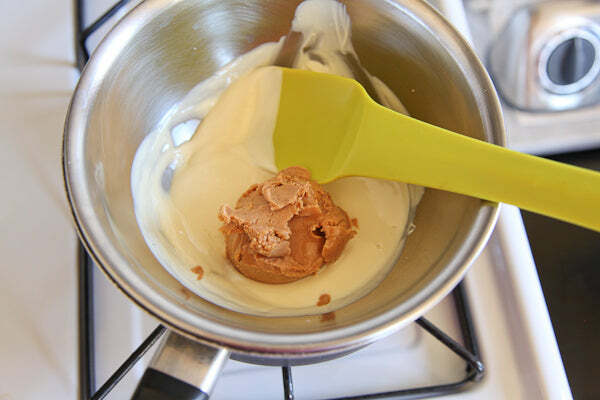 Add the White Chocolate Wonderful peanut butter, sesame oil, vanilla, salt and the bag of marshmallows to the hot brown butter and stir until the peanut butter and marshmallows have melted into a sticky gooey mess. 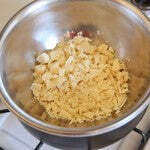 Add the box of crispy brown rice cereal and stir until to evenly coat the cereal. 4. 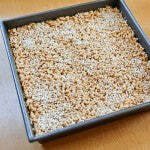 Pour the cereal into the oiled baking sheet and press down on the cereal to evenly distribute throughout the pan. 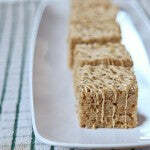 Sprinkle with white or black sesame seeds and let firm up for an hour or overnight. 5. 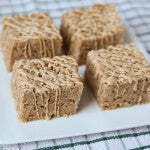 Remove from the pan by sliding a thin butter knife on the side of the pan and pulling the rice crispy treat out as a block onto a cutting board. Cut into 16 pieces. 6. Melt the white chocolate by placing the chocolate in a metal bowl that is tightly fitted over a pot of water (make sure the water is not touching the metal bowl). Turn the heat on to high and once the water is boiling, turn the heat off. Let the residual steam heat the metal bowl and melt the white chocolate. 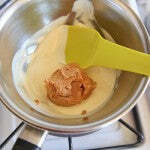 Once the white chocolate is melted, add the White Chocolate Wonderful peanut butter and stir until well blended. 7. 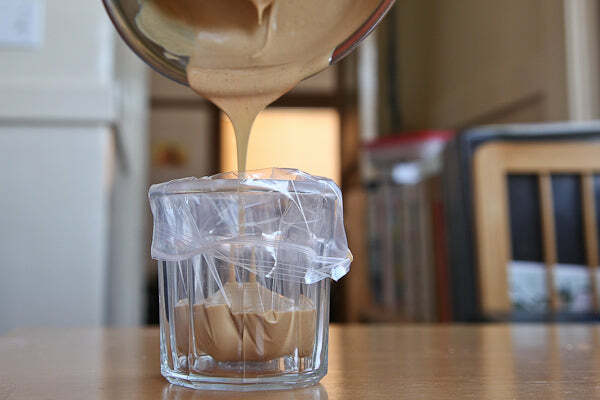 Pour the ganache into a ziplock bag and then snip one tiny corner of the ziplock bag. 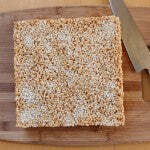 Squeeze the ganache onto each rice crispy treat in a diagonal pattern. Let cool to firm up the ganache and serve at room temperature. 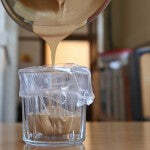 What else would you drizzle this peanut butter ganache on? – The giveaway is open to USA residents only and will run until Monday, February 3, 2014 at 11:59 PM EST. – Winner(s) will have until 02/6/14 to claim their prize or we will choose another winner. 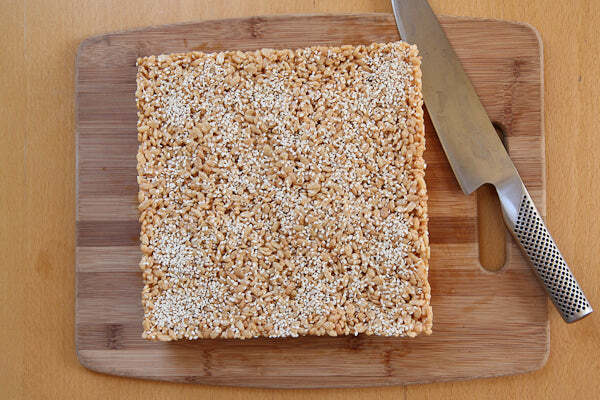 The post Peanut Butter Sesame Rice Crispy Treat appeared first on - Peanut Butter & Co. Recipe Blog.